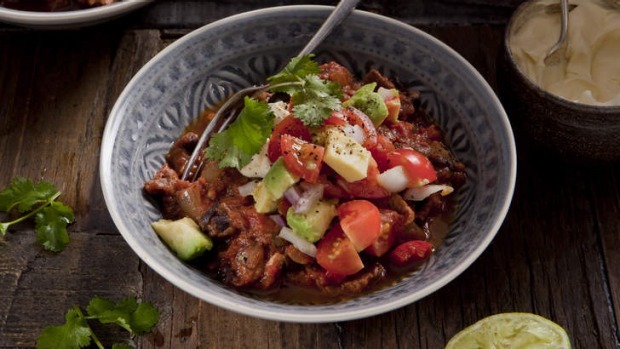 Tinned black beans simplify this version of chilli con carne. If you can't find these, soak dried beans overnight and add them to the pot with the beef, as they will need a longer cooking time. You could skip the beef for a vegetarian version. Preheat oven to 150C. Heat oil in a large heavy-based oven-proof pot and cook onion, garlic and chilli until softened. Remove from pot and set aside. Toss steak in flour then cook in batches in the pot until browned, adding extra oil if required. Return cooked vegetables to the pot and stir in tinned tomatoes. Cover and cook in oven for 1 1/2 hours. Remove from oven and check if meat is tender. Add beans and capsicum and return to oven for 30 minutes. Meanwhile, make salsa. Chop avocado into small dice, quarter cherry tomatoes and mix with red onion and coriander leaves. Squeeze over lime juice and season with salt and pepper. Remove the chilli and beef from oven and serve with salsa and sour cream.